Flat-rate travel rewards with no foreign transaction fee. The 25,000 sign-up points after only a $1,000 spend within the first 90 days is generous for a no annual fee card. The 1.5X points on all purchases is also quite nice. 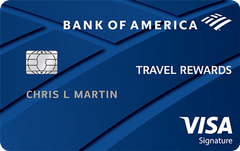 The Bank of America Travel rewards credit card is among our picks for the best credit cards of 2019. Our take: The Bank of America® Travel Rewards credit card is a solid travel rewards credit card with no annual fee, a generous sign-up bonus, and a simple earning and redemption scheme.